When ya think of it, it has been some time since the East Coast influenced the West Coast. Once Lewis and Clark got out there and started wearing polyester, drinking kale juices and surfing, that was kind of the end. The West Coast has been the trend setters since. The above photo is proof of the change in progress. It would appear that someone from East Liberty has taken “Pittsburgh Parking Chair Outreach” seriously and is now disciple-ing in the San Francisco area! This guy was determined to fit all those chairs in that little truck. Needless to say he was swerving all over the road when he left. Well HELLS yeah he was determined. He wants to be sure that everyone gets a parking chair under their tree this Christmas season.Now THAT sir, is a mission and thanks for doing it so well. 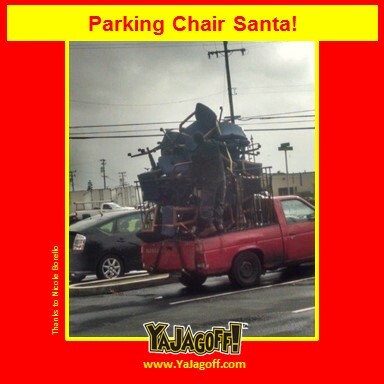 He Parking Chair Santa of San Francisco, good luck with your mission and, if ya can’t get rid of those chairs, at least you can be the very first to operate the mobile chair-Jenga game. Hope you have good cable… and I DON’T mean the stuff that brings HBO into your living room. Hope you’re good at tying knots, Ya Jagoff! Thanks, once again, to Nicole Borello for being our Honorary Jagoff Catcher. This is her third catch and is now officially our San Francisco Jagoff Catching Bureau Chief! Raffle winner from yesterday’s blog is Joe Gianella who gets a copy of the book, “Above the Fries” and an iTunes Gift Card. Next articleDoes Sidney Crosby Have the Mumps or….